traffic Archives - Khaled Rent A Car in Dhaka, Bangladesh. Your Secured and Trusted car rental partner. With the numbers and assorted varieties of vehicles (some of which have to be seen to be believed!) on the Dhaka streets having skyrocketed in recent years, traffic jams have become have an inevitable part of the daily lives of Dhaka-dwellers. Whatever vehicle you happen to use yourself, there is absolutely no way to avoid the regular traffic snarl-ups that occur all over town. Under the circumstances, most of us have to resign ourselves to the cacophony around us, and concentrate on trying to think about something else – anything else! After all, we don’t have the options of some of the inhabitants of Bangkok, who consider the time spent in traffic jams every day to be part of “family time”, and have TVs and fridges installed in their vehicles to help pass the time. On the other hand, since we presumably don’t want to end up to infamous inhabitants of Los Angeles (some of whom have been known to shoot after drivers in the midst of traffic jams – perhaps as a means of expressing their frustrations! ), some harmless form of entertainment should be found to help us pass the time. One useful option is to cultivate an interest in “rickshaw art”. Seriously, it is quite interesting to see the wide range of pictures which are which are painted onto the backs of baby-taxis and rickshaws. You see everything from fluffy white kittens to coy parrots and cavorting dolphins. Familiar scenes for Dhaka are include the parliament building and the martyrs’ monument, but then you also see quite peculiar scenes such as an alpine village nested at the foot of snowcapped mountains (no doubt painted by an artist longing for some coolness in the midst of the Bangladeshi summer!) or a grim-looking Rambo figure toting a remarkably large gun (anyone want to comment on the evidence of cultural imperialism here?!). Along with the traditional depictions of the Taj Mahal and lush green villages, you can see the rather more avant-garde Sydney Opera House, and any number of futuristic metropolises, with curving highways, high-tech cars and towering skyscrapers. But my own favorites are the occasional animal figures (lions, tigers, jackals) seen riding on rickshaws, driving speedboats and shooting at sea-gragons. There is clearly no limit to the artistic imagination! If that pastime palls, then you can turn to the interesting messages that are written on the back of some of the trucks that ply the city. A sense of humor is very evident in many of these writings. Take the following: “Biri Khabi Kha, More Jabi Ja” (roughly translated as. 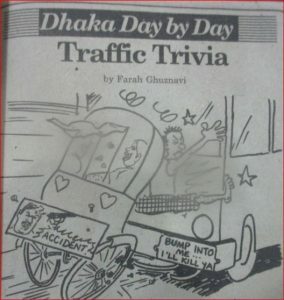 “You want to smoke, then go ahead and kill yourself.”) A number of these statements are concerned with the possibility of excessive closeness between vehicles leading to accidents — ranging from inscribed, “Chhi, Chii, tumi ato kachey” (Shame on you for coming so close to me) to the more progressive. “Akbar laiggai dekhen na” (Why don’t you bump me just once and see what I do to you) “Ei, shon, lagley khobor achhey” (Hey, you, if you bump into me then we’ll really have something to talk about). Nor are the baby-taxis being left behind in this game. One zoomed past me, bearing the legend, “Ei rasta kobey phurabey” (when will this road finally come to an end). A number of them have also adopted the slogan of “Amakey mero na, ami choto” (don’t hit me, I’m little). Though perhaps in their case, it has less to do with a sense of humor and more with a sense of self-preservation! 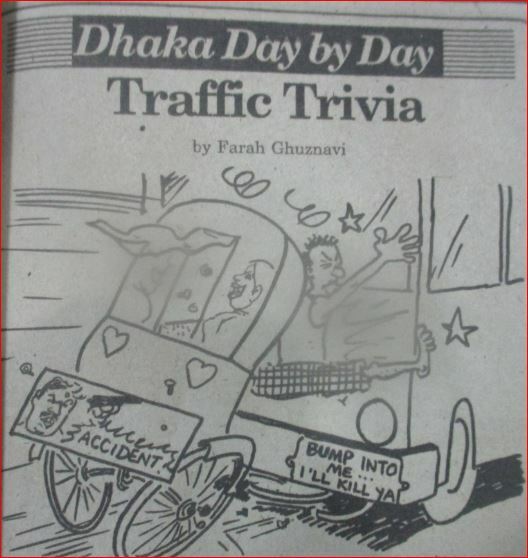 Whatever their motives, they certainly provide the bored motorist w3ith some amusement during Dhaka’s rush-hour gridlocks.